The Coastside Film Society to screen two pre-release films about Latin America by local filmmakers. With Bonus Live Music! Coastside Adult Community Ctr./Sr. Coastsiders. A poignant tale of a young boy who honors his grandfather on the Day of the Dead by protecting the endangered Olive Ridley sea turtles that nest near his home. Gail Evenari, the local filmmaker who shot this film in Mexico, will attend the screening. The score for our short was composed and performed by Maikel Garcia, a Cuban-born jazz saxophonist who lives now in the Bay Area. He will perform live at the screening with pianist/bassist Ander Meyer. A documentary shot in Santiago de Cuba by the Film Society’s own Warren Haack. 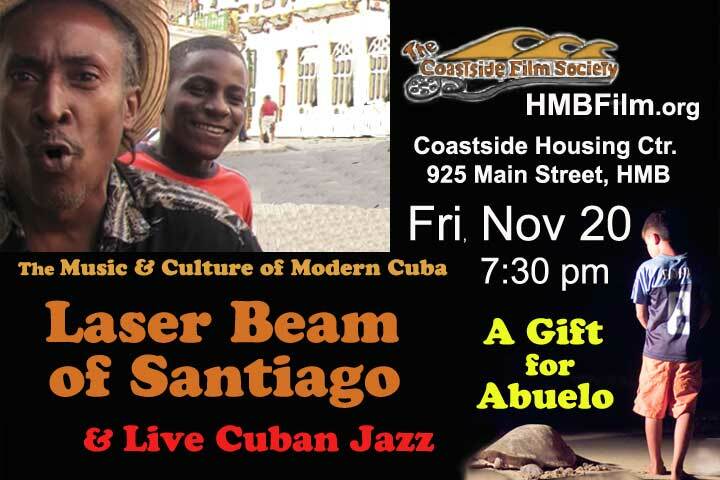 The film focuses on the life and music of Sergio delis Sabouvin (the Laser Beam of Santiago) a street performer who gets away with singing protest songs in Communist Cuba because of the honesty and humor of his music. This intimate, lively documentary follows Sabouvin in several impromptu performances and gives the audience a view into the Cuban consciousness through his music. His performances and messages exemplify the spirit of hope that glimmers as relations between Cuba and the U.S. have begun to thaw. “The film has an infectious quality and a real-time feeling that brings this great talent to us as if we were right there with him and his audience in the streets of Santiago. Bravo Sergio! Bravo Warren!”—Joseph McBride, film critic and historian. Start or join the discussion on Coastsider Forum. Our forum is in site right now, so drop us a line if you have questions, feedback, or bugs.